People in Bosnia-Herzegovina see few opportunities to start a business, but their entrepreneurial intentions are increasing due to high levels of unemployment. Therefore, necessity entrepreneurship – when an individual has no other option for work – is more common than opportunity entrepreneurship – when an individual is pursuing an opportunity or trying to increase their income/independence. In recent years, there has been a significant increase in the number of new businesses, with a concurrent decrease in the number of established businesses. However, data for 2014 show the opposite trends. Growth aspirations are low – the majority of entrepreneurs expect to employ no more than 5 new workers in the next 5 years. Levels of innovation are also moderately low; however, these entrepreneurs are increasingly engaging with international markets. Most of these trends are similar to the other countries in the Western Balkans region; only Slovenia has more opportunity entrepreneurship than Bosnia-Herzegovina. The average entrepreneur in Bosnia-Herzegovina is a young male, aged between 18 and 44 years of age, who started a business following graduation from university or vocational school, because he had no other option for work. His business is either in the consumer services or manufacturing and construction sector. However, entrepreneurship is highly constrained by inadequate policies and programs at all levels of government. New policies are insufficient while existing ones do not favour new and growing companies. A low level of market openness prevents new businesses from emerging, while existing entrepreneurs are burdened by high and multiple taxes. Additionally, the political situation has created a non-unified national market, threatening sustainable economic development. A lack of R&D transfer programs and poor cooperation between providers of entrepreneurial education has a negative impact on entrepreneurship development and the competitiveness of the country. Infrastructure to support entrepreneurs (business incubators, local and regional development agencies etc.) is gradually developing and there is a growing number of entrepreneurship development organizations in Bosnia-Herzegovina. However, there are no strategies, programs or initiatives at state level. At lower levels, there is the Ministry of Development, Entrepreneurship and Crafts of the Federation of Bosnia-Herzegovina which offers incentives for entrepreneurs and for the development of the entrepreneurship environment. Another entity, the Agency for the Development of SMEs of the Republic of Srpska, supports the establishment and development of SMEs and entrepreneurship, providing a comprehensive support system. Since first collecting GEM data in 2008, we have seen more and more people intending to start a business but only a small number actually doing so. Those who did it, did it mostly out of necessity – having no other option for work. For the same reason (unemployment) there is an increasing number of young entrepreneurs in Bosnia-Herzegovina. In such an environment, it is hard for high-growth companies to thrive; this is something that should be addressed by the government. National entrepreneurship experts, surveyed as part of the GEM National Experts Survey, tell us that governments have failed to implement (quality) entrepreneurship development policies and programs. However, these experts also tell us that entrepreneurial education in Bosnia-Herzegovina seems to be developing. The major challenge for Bosnia-Herzegovina is to develop entrepreneurship development policies at the state level, as well as providing state funds for entrepreneurship incentives. The entrepreneurial learning strategy which has been adopted now needs to be properly implemented; the government also needs to establish one-stop shops and reduce the tax burden on entrepreneurs. Furthermore, the entrepreneurship infrastructure of the country needs to be developed and improved. This fifth B&H GEM Report is focused on interaction between entrepreneurship education and youth employment, actually their decisions to be self-employed by starting an own business. 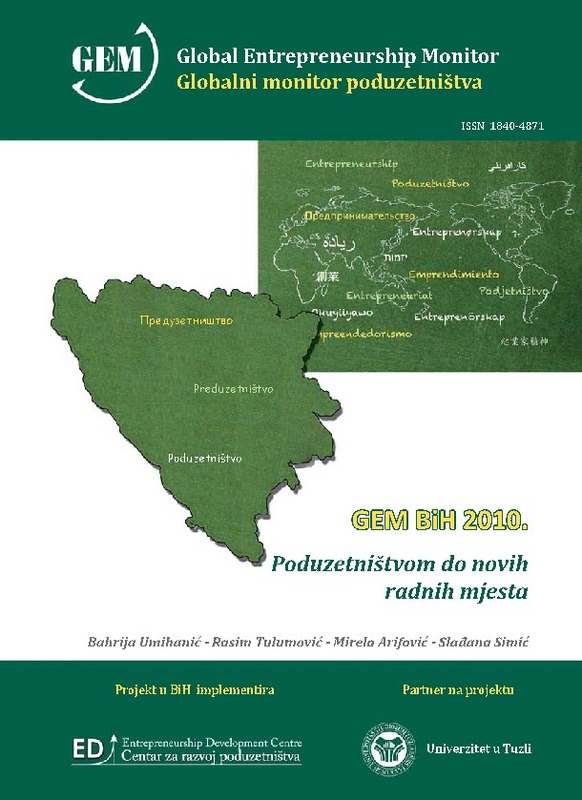 GEM Bosnia and Herzegovina 2011 Report was published by the GEM team Bosnia and Herzegovina during April 2012. GEM team Bosnia and Herzegovina makes special analysis of GEM indicators for administrative units in Bosnia and Herzegovina, and make comparison with results of surrounding countries. 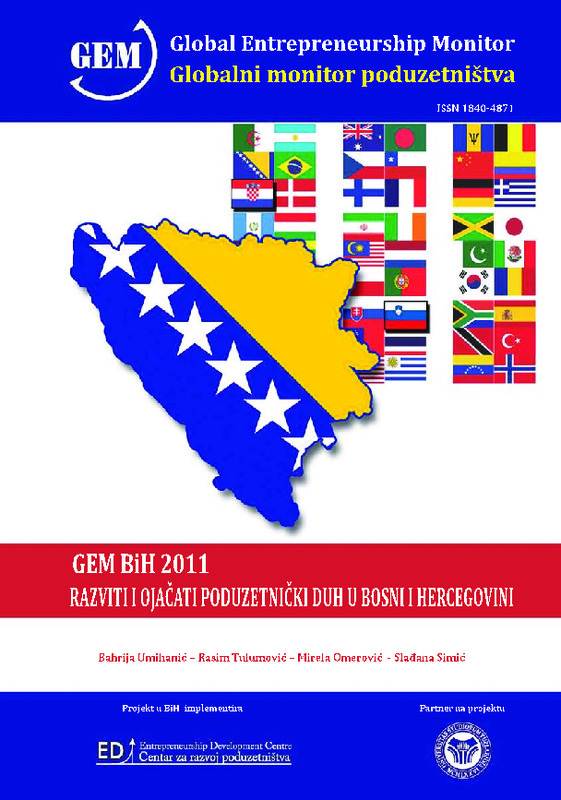 GEM project in 2011 in Bosnia and Herzegovina was supported by the Federal ministry of development, entrepreneurship and crafts, Ministry of development and entrepreneurship of Tuzla Canton and Tuzla Municipality. Executive summary is in English.